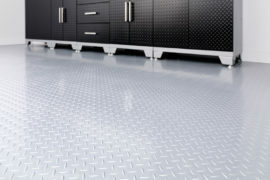 We provide you complete flooring solutions that create an upscale look while protecting your garage floor. Weather you want to expand your living space or just showcase your ride. Our Gladiator Floor Tiles cover cracked or stained garage floors without the preparation of liquid coatings. They provide a clean looking and durable surface capable of holding heavy vehicles. The tiles are part of a complete flooring system that also includes flow-through Drain Tiles to allow access to floor drains as well as Edge Trim pieces that create a finishing touch. 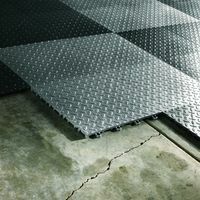 The 1-Foot x 1-Foot tiles are engineered to handle the temperature extremes of the garage and resist common chemicals. 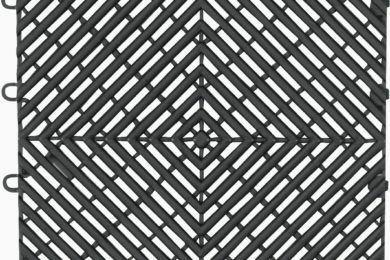 Custom designs such as checkerboard patterns and borders in both under-vehicle and wall-to-wall applications is possible. 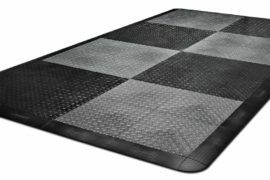 Ideal for work and storage spaces, the Gladiator Garage Floor Pack features a slip-resistant steel design. A black and charcoal checkerboard finish adds a classic accent to this versatile, practical set. Dimensions: 12W x 12D (2.2mm height). 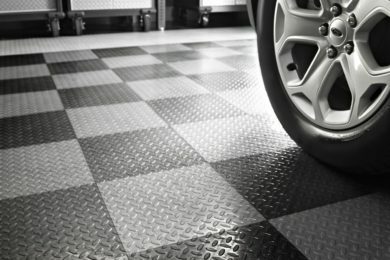 PVC Flooring is another durable option for a garage that looks equally industrial slick with a UV coat that protects it from the harsh effects of seasonal temperature change. Extra resilient, the VersaRoll is designed to withstand damages and keep up with the rough conditions of your garage. Rolls are sized 8 ft. x 20 ft. (2.2mm height).